Anthony Aguilar has been working on his ’62 Chevy Impala for a while and wanted to make it look even better. The exterior of the car had already been completed and the frame had been reinforced by Frank at Frank’s Hydraulics. The car was ready to have a hydraulics setup dropped in. Anthony and his friends Jesse Murillo and Anthony Sagasta took on the task of designing and building a hot trunk setup. After figuring out where everything was going to go, Anthony’s team started plumbing the CCE Hydraulics setup. Anthony used Fatboy series blocks equipped with three Adex chrome dumps. 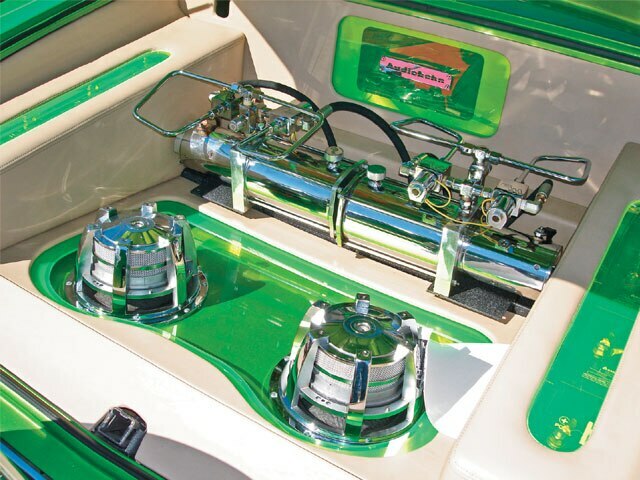 Anthony went back to Frank’s Hydraulics for eight 31-series batteries, along with the fittings, check valves and slow-downs that were used for the setup. The trunk compartment received custom panels to make it “float” better. After three weeks of construction, everything was taken apart and sent out to the chrome shop, while other pieces were painted by Anthony to match the car’s exterior. Once everything was returned, the setup was put back together and Anthony was ready to roll. Anthony’s work resulted in one clean trunk, which holds it down for his club Spirit C.C., letting everyone know that the club still has custom trunks worthy of our Dumps department. Anthony’s ride should be featured in an upcoming issue of Lowrider, but for now, he told us that he still has a few things that he wants to add to the car. Mike Valdez has built a few custom cars prior to putting together this candy organic green ’64 Chevy Impala convertible. It was the car’s custom paint job that caught our attention in the first place, though it was the trunk that kept us there. Mike’s custom ’64 was put together as a street car, but needed a few touches to get it ready for the show circuit. 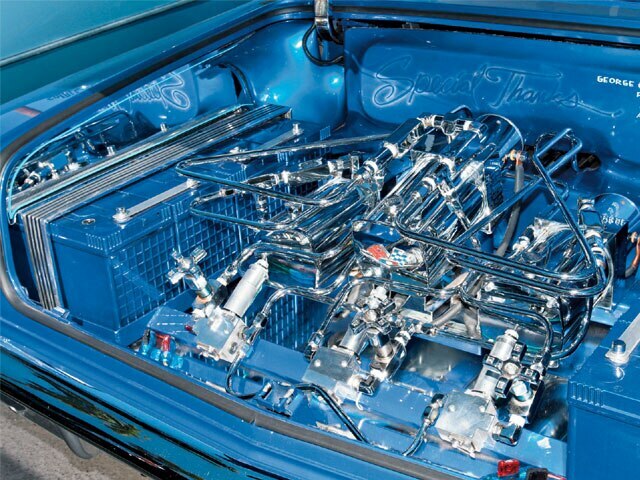 Mike decided to hook up the trunk with a custom trunk kit that would complement the Hi-Low Hydraulics setup. The weekend warriors tackled the trunk task one weekend. Mike installed Audiobahn amplifiers and two 12-inch woofers. Mike did all of the woodwork on the custom speaker box that holds the woofers in place, and his friend Tim Gallardo did all of the wiring for the sound system. The Delgado Brothers wrapped the panels in vinyl with lime green see-through Plexiglas to tie in the trunk with the exterior of the car. Mike tuned the show-quality sound system. Mike’s audio/hydro creation features the best of both worlds. We hope to see his clean green ’64 convertible in a full feature in Lowrider soon.